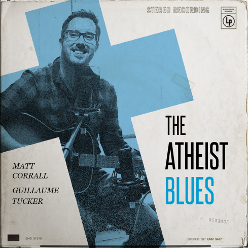 The Atheist Blues is a defiant, upbeat and slightly silly track about laughing at the church. Some years ago I fell for a girl who was a 'born-again' Christian. As the title implies, I’m an Atheist myself, but this little detail didn’t stop me embarking on a relationship nonetheless. Over the next couple of years, I spent a great deal of time in the company of evangelical and ‘born-again 'Christians, without exception as the lone heathen in the room. Whilst I approached this new experience with patience, tolerance and a smile, my new friends had different ideas. Many, many conversion attempts later they eventually gave up in frustration, but I don’t think they ever knew what to make of me. Bible discussion groups, brain-washing, lectures on the afterlife.. my friends couldn't believe the daft situations I kept finding myself in! When the relationship came to an abrupt and unexpected end, I turned to my guitar and my song-writing to express myself. The Atheist Blues is about laughing long and hard at the church and all its ridiculousness. Singing this lets me laugh at all those strange experiences and never fails to bring a smile to my face… enjoy!